Recently I spent 155 minutes watching an old silent film at the Seattle International Film Festival. I LOVED every minute. The film tells the story of a thief, Ahmed (played by Douglas Fairbanks) who falls in love with a princess (Julanne Johnston). In order to win the hand of her in marriage, royal suitors are challenged to “find the rarest of treasures”. Ahmed, disguised as a prince goes through a series of mystical trials to find his treasure and in the process saves princess and the whole kingdom from the evil Prince of the Mongols. This 1924 film was directed by Raoul Walsh and art directed by William Cameron Menzies. In the screening we watched, Orson Wells introduces the film and talks about the amazing scenery, costumes and effects created for this film. 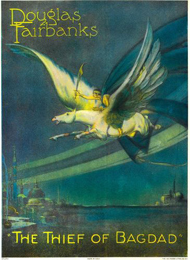 Flying carpets, flying horses, fiery caves and a fantastic underwater world required film makers to invent special effect techniques to create this magical film. At the time, the film cost $2 million to produce and details about the creation of the special effects were reported in scientific magazines. It’s amazing to see the sets and effects that film artists were creating over 85 years ago — without the use of computer generated images! For the last 30 years, Shadoe Stevens (yes, the DJ) has been working to create a modern soundtrack to accompany this great film. This latest version incorporates the music of Electric Light Orchestra. It’s a perfect choice of music and seems to fit perfectly with the film. This movie was so upbeat that I smiled throughout the whole film! At this point, the film is not been released — try to see this version if you get a chance.